Asia Wohnstudio 3 Fold With Extra Large Triangle Cushion Xxl Jumbo Asian Thailand Pillow / Headrest & 100% Kapok Filling (Red Elephant) Red Elephant by Asia Wohnstudio at Thai City Deals. MPN: 21544887. Hurry! Limited time offer. Offer valid only while supplies last. Thai cushions with 3 folds 100 % kapok Thai cushions (triangle cushions) of the Asia Wohnstudio brand Colorful Thai cushions directly from Thailand! Size of Thai cushion unfolded: 180 cm (length) x 55 cm (width) x 8 cm (height) Size of Thai cushion folded up: 45 cm (length) 66 cm (height) x 55 cm (width) Weight of Thai cushion: 7 kg Filling: 100% natural kapok of the kapok tree Cover: 100% cotton. We only use pure and very durable cotton Our Thai cushions are handmade in selected family companies and imported by us directly without intermediaries! Asia Wohnstudio Thai cushions are filled with pure and untreated kapok! 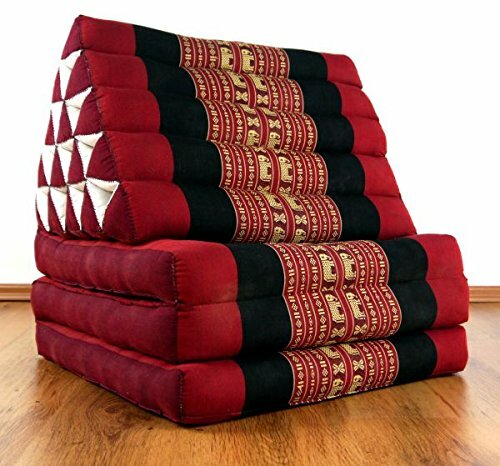 Dimensions of the Thai cushion (unfolded): 180cm (length) x 55cm (width) x 8cm (height).